Agriculture is weather dependent at the local level. Yet, currently, farmers do not have access to reliable locally relevant meteorological and agricultural information by which to plan and manage their farming operations. Information presently available is based on inputs from weather stations that are located at taluka places and which are manually obtained. In the monsoon-driven weather system that is ours, local agro-meteorological conditions, especially rainfall, vary within even a kilometer; and such distantly located weather stations are not able to provide data that can generate locale-specific knowledge and advice. In earlier days, before technology drove our lives, the elders of the village planned their agriculture activities based on how they sensed the forthcoming weather and what they observed in the surrounding flora (plants and trees) and fauna (insects, birds and animals). Most of this indigenous knowledge is now lost. It is, thus, important to retrieve, document, analyse, utilize and disseminate practices that are promising and useful. Local weather data is available to the farmers. Local community understands and uses weather information for agriculture planning and management. Agro-advisories are provided based on local weather data. 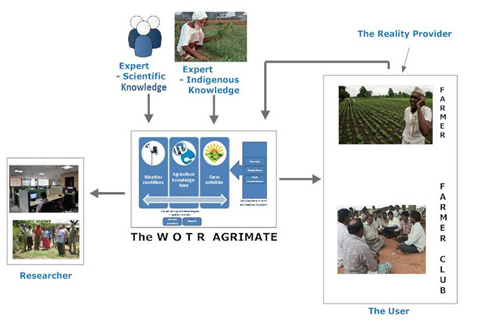 This film describes the WOTR’s Agro-Meteorology component of a Climate Change Adaptation Project which combines locale-specific Met-advisories and Agro-advisories to provide timely weather information to help farmers plan their agricultural activities through Agromet stations installed in 29 villages in Maharashtra. A web-based initiative, it is marked by its unique automated platform and software to provide village weather trends that can be up scaled more widely. The advisories and met-forecasts are shared with the communities through phone and SMS technology.